Daily life at our school is based upon fostering a love of learning and encouraging all of our children to be curious, tenacious, independent and above all else, happy, lifelong learners. 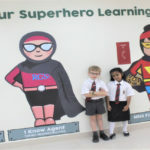 Building upon the success of RGS Guildford in the UK, we ensure that all of our pupils in Qatar acquire the sixteen RGS Learning Habits, which are taught through our very own RGS Super Squad characters. Even our youngest children enjoy learning from the RGS Superheroes and strive to emulate their values and characteristics in their own learning behaviours. These habits include the ability to learn with creativity, to work effectively with others, to be reflective and to take responsibility for their own learning and organisation. The acquisition of these Learning Habits not only helps RGS pupils achieve the outstanding academic progress for which the School is renowned, but also prepares them well for the challenges they will face beyond life at the RGS. 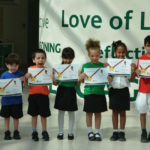 They will have the know-how, the ability, social skills and confidence to achieve their ambitions. Love of Learning I enjoy learning for its own sake. Tenacity I am able to respond positively to challenges and persist when I have setbacks and disappointments. Precision I take care to understand tasks and complete them to a high standard. Creativity I am able to be imaginative, creative and/or original when I am learning. Teamwork I am able to collaborate as part of a team with others. Engagement I am an active participant in learning, asking and answering questions and listening to others. Imitation I am good at noticing and able to learn from what others do well. Perspective I am aware and take responsibility for my well-being and that of others. Summarising I am able to look back at what I have done, picking out key points, summarising, distilling and memorising. Reasoning I am able to adopt a rational approach and can draw conclusions from accepted truths or evidence. Linking I am able to apply my skills and knowledge across subjects and in unfamiliar situations. Criticality I am willing and able to test claims of ‘truth’. Reflection I seek out feedback on my work and use it to evaluate and improve my learning. Organising I am able to manage my time and resources effectively. Independence I am an active learner, able to take the initiative and plan my learning; I am self-motivated and take pride in, and responsibility for, my work. Practice I practice to improve my learning.